Leave That Fridge Alone: This New Pizza Place Delivers Till 4 AM! 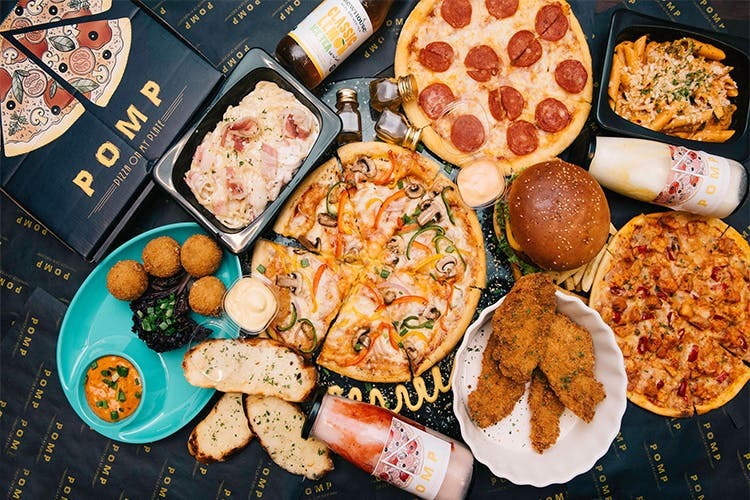 Pizza On My Plate (POMP) is a new late night delivery joint that's serving fingerlicking pizzas all the way till 4am. If like us, your go-to 3am meal is a loaded pizza, (and your pizza isn't something to be taken lightly), POMP will not disappoint. They're doling out fresh pizzas through the night that taste so good that you may be tempted to ditch your usual pizza joint. With pizzas named after song titles, we love how they’re doing an interesting mix of everything. Carnivores definitely need to try All The Stars, a three-meat pizza that’s got pork, chicken and lamb. Pork lovers need to try the Rockstar with bacon and pepperoni and God's Plan, a classic pepperoni and cheese (isn't that the most apt name?). Vegetarians will love Another Brick In the Wall and Hotel California, both with paneer and so good. We recommend you ditch the diet and go for their cheese burst pizza, we hear excellent things about these. They're also doing pastas and burgers. Try the Donald Trumppp Burger (fried chicken FTW) and their George Bush Burger with all your veggies. Special mention goes to their Mac n Cheese. It hits all the right flavours and works great for a quick bite. Fun fact: Their pizza box itself turns into four plates and they send you cutlery too. You literally need nothing else. House party or midnight cravings, POMP's got your back with fresh food till early morning. You can follow them on Facebook to check out new additions to their menu.